The Symposium will focus on the key legal, financial and policy issues involved the finance of renewable energy. What can our governments do to facilitate investment and production? What can private companies do in uncertain times? What lessons can we learn from abroad? Leaders from legal practice and academia, private investment, energy companies and all levels of government will cover these and other questions in three panel discussions. 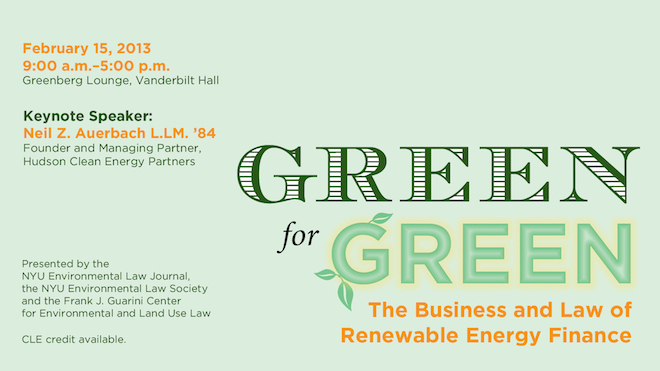 The Symposium is presented by the NYU Environmental Law Journal, the NYU Environmental Law Society, and the Frank J. Guarini Center for Land Use and Environmental Law. Speakers include Nat Keohane (NYU School of Law; former Special Assistant to the President, National Economic Council), David Hill (NRG Energy), Reed Hundt (Coalition for Green Capital), Robert Freedman (Shearman & Sterling), Jonathan Wolfson (Solazyme), John Williams (NYSERDA), Keith Johnson (Wall St. Journal), Michael Likosky (Institute for Public Knowledge).